With Dark Synth’s 2048 independently-controllable partials (sine wave oscillators) it’s possible to create everything from classic waveforms such as sawtooth and square, to complex custom waveshapes. But this is only the beginning – with direct access to each partial, you can take total control of your sound. Within minutes of using Dark Synth you’ll be crafting complex and dynamic sounds; from rich Detroit-style techno pads to lo-fi chillwave soundscapes, Dark Synth will give you amazing sonic flexibility with the most precise control. Dark Synth excels when it comes to generating strange and otherworldly sounds. Filtering and distorting waveforms at the spectral level will open up a world of experimental possibility. Spectral transformations can be accessed directly from the hands-on interface. A unique feature of Dark Synth is the capability to create up to 128 detuned and phase-shifted copies of all 2048 partials. This vast ‘choir’ of oscillators creates a deep and natural chorus effect. Dark Synth harnesses the latest Max for Live technologies and is a synthesiser quite unlike anything that has come before. Welcome to the cutting-edge of digital synthesis. Additive synthesis can be described as an extension of the draw-bar organ; A set of sine-wave oscillators in harmonic series are mixed together in different amounts to shape the tone of a sound. The legendary Hammond Organ had just nine oscillators, a limitation imposed by the physical size and cost of the instrument. 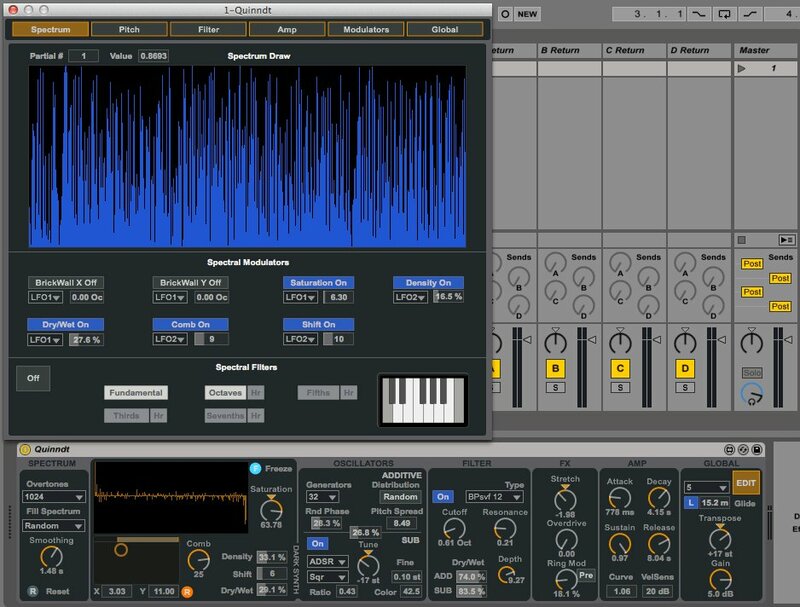 However with the help of virtual oscillators, the real power of additive synthesis can be realised. With enough oscillators whose amplitude can modulated, it's theoretically possible to create any sound.